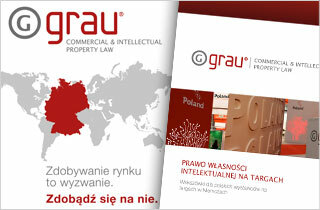 In 2013, GRAU law firm was the consulting partner on intellectual property law and commercial law to the Department of Commerce and Investment of the Polish Embassy in Germany. 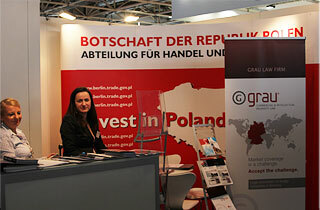 In this capacity, Adriana Grau, LL.M., Attorney at Law, was available at the Republic of Poland’s exhibition stand to provide advice on a broad range of legal issues to Polish exhibitors at HANNOVER MESSE. 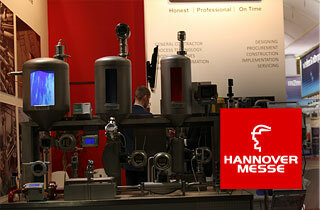 The exhibitors’ questions revolved in particular around intellectual property law and starting a business in Germany. At its stand GRAU law firm also presented its range of services aimed at supporting foreign entrepreneurs in importing goods and services to the German market and doing business in Germany. Numerous foreign businesspeople interested in the legal framework for entrepreneurial activities in Germany and for exporting goods or services to Germany visited the law firm’s stand. The high number of visitors and their numerous questions impressively underscored the attractiveness of the German market. GRAU law firm is a German law firm specializing in the areas of commercial and corporate law, as well as industrial property rights. It also offers professional receivables management. The title of Specialized Lawyer (“Fachanwalt”) is granted by the Council of the Bar exclusively to attorneys who are proven to have handled a large number of cases pertaining to the field of law concerned and have successfully taken part in a specific training course lasting several months and passed the requisite examination.